Youth Ministry still struggles to identify universally what it’s primary mission is: discipleship, evangelism, or something else. Within the local church there are still people who see YM as babysitting. A general uncomfortability with the role as “indoctrinator” by youth workers in the local church. A straying away from teaching the Bible into a pure social/entertainment thing. A lack of understanding of youth culture and no desire to learn it. Absolutely no ability to connect adolescents to the body after they graduate. Getting kids excited about being in the church. Allowing students to develop leadership skills. Being an entry point to kids of all backgrounds to the church. A swing towards small groups ministry. Most youth workers are very authentic to their kids. A desire to do ministry outside of the church and where kids are. I think as a profession we need to develop some standard goals. Why do we do youth ministry? How does one get the label as a professional youth worker? What are the standard things ALL youth ministries should be doing? Stuff like that. Youth workers need to care less about attracting kids and care more about fitting their youth ministry into their church model and visa versa. Youth workers need to get serious about training their adult volunteers. We need to get past games and music and into something deeper. In the 1980’s Dan Spader, president of Sonlife, said “It’s a sin to bore a kid with the gospel.” I want to revise that to say, “It’s a sin to never teach a kid the gospel.” I can’t tell you how many times I’ve heard a kid from other youth groups who visited our YM say that they have never heard the bible taught to them. When ministries begin teaching solely topically, they are truly missing out on something big. 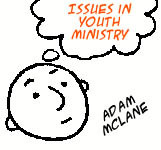 Adam McLane is a youth pastor, a blogger and founder of YMexchange.com. Check him out at www.AdamMcLane.com.